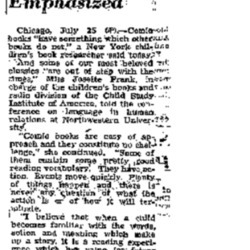 Washington Post item on value of comics to developing literacy. Bender's study of 'therapeutic' value of comics. Bender's study of comics as healthy fantasy. 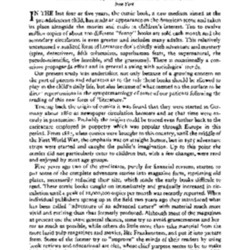 Public opinion about the influence of comics on the young, in no small part swayed by Wertham and fueled by anxiety over a perceived epidemic of juvenile delinquency, had become by the end of the 1940s increasingly negative. As a number of recent studies of the events leading up to the institution of the Comics Code Authority in 1954 and the industry's abandonment of crime and horror comics (in particular) have argued, the appeal of a correlation of juvenile crime and unsavoury comics was attractive in its simplicity (see Hajdu, Nyberg, and Bradford, for example). Often drowned out by the increasingly fervent anti-comics rhetoric of the late 1940s and early 1950s was a counter-current of voices promoting the value of the medium: as for, example a literacy building tool or a psychologically healthy form of escapism. 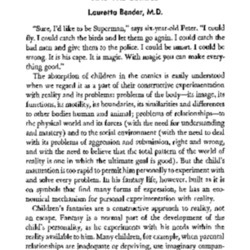 Perhaps the most notable early defender of comics reading for young people was the child neuropsychologist, Dr. Lauretta Bender. 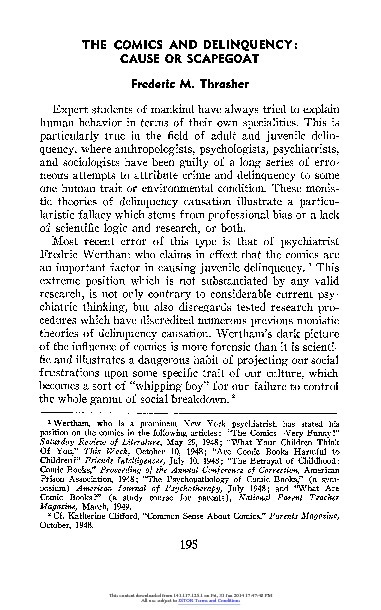 A year after Sterling North's initial anti-comics salvo, his editorial 'A Nationl Disgrace' (1940), Bender published an article in the American Journal of Orthopsychiatry, in which she described the comic book reading of one of her test subjects as "therapeutic in that it tended to allay her anxiety" (543). In 1944, Bender followed this up with another study published in the Journal of Educational Sociology that detailed how "comics fantasy... enhanced the securities needed to solve life's problems" (228). Thrasher's challenge to Wertham's methods.